Since 1998, NEADS has organized thirteen Disabled Student Leadership Forums across Canada. These events have been held in Montreal, Ottawa, Calgary, St. John's, Antigonish, Yellowknife, Winnipeg, Toronto, Victoria, Vancouver and Halifax. Two meetings have taken place in Calgary and Montreal, while project workshops were held in Ottawa in conjunction with the November, 2002 national conference and a full day forum took place on September 26, 2003 at the Delta Hotel. Detailed reports on each of these meetings are available on the NEADS Web site at www.neads.ca. The ideas and issues discussed with participants during this initiative, in the first three years, fell into the following distinct areas: support to campus organizations, support to individual students, expanded Internet services, high school outreach and differences between small and large post-secondary institutions. The NEADS board of directors decided to build on the success of earlier forums by expanding the topic areas discussed to include employment starting in 2001/2002. This decision was made based upon an awareness of the importance of labour market issues and access to the job market for graduating students, and the importance of summer or part-time work for those still in school. With the board's direction, NEADS has moved to develop an exciting partnership with Human Resources Development Canada's (HRDC) Youth Initiatives Directorate in order to deliver a new project with additional, employment related components. Successful forums with this new focus were held in Toronto, Victoria and Montreal in 2001/2002. A second phase project ensures that NEADS can hold additional forums in 2002/2003 in: Calgary, Vancouver, Ottawa and Halifax. The forums are sponsored through a contribution agreement with HRDC's Youth Initiatives Directorate (Information and Awareness Program) and are being hosted by members of the NEADS board of directors in collaboration with the Association's national office and a project consultant. Students with disabilities are invited to participate in the forums, to lend their insights to the issues at hand. A number of groups and organizations are asked to speak to the students: regional HRDC representatives, employers and employment agencies, and leaders of both student and disability organizations. This report is based on the proceedings of the fourth NEADS Student Leadership and Employment Forum of 2003, which took place on Friday, October 24th at the Westin Nova Scotian Hotel in Halifax, Nova Scotia. The event was attended by about 40 students and graduates with disabilities, service providers and industry representatives. Iris Peoples of the Human Resources Development Canada, Halifax office was in attendance. Participants were from local colleges and universities including Nova Scotia Community College, Saint Mary's University and Dalhousie University. A large group of students and service providers made the trip from Mount Allison University in Sackville, New Brunswick to represent their school. Steve Estey provided welcoming remarks and his perspective on "student leadership", while NEADS' Nova Scotia Representative Jennifer Finlay acted as Chair for the day-long forum. We were pleased to welcome representatives from other non-governmental organizations as speakers at the event and also as participants in the group discussions. Jennison Asuncion, Manager of the NEADS Web site, also attended the forum. 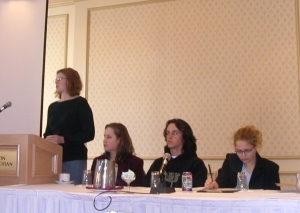 In keeping with the format of the 2003 NEADS Student Leadership and Employment Forums, the first half of the day concentrated on issues of student leadership, while the afternoon discussion focused on employment-related issues of relevance to students with disabilities. In the morning, participants were treated to presentations by panelists Kim Cooper, Coordinator, Nova Scotia League for Equal Opportunities; Angela Bowie, Executive Vice-President, Dalhousie Students' Union (Student Accessibility Fund); Joel Miller, Saint Mary's University Students' Association, Students With Disabilities Representative; Stephen Noel, Employment Development Representative, Student Employment Centre, Saint Mary's University; and Steve Estey, Project Consultant, NEADS. In the afternoon, speakers addressed the subjects of employment and the transition from school to work. Panelists included: Chris Gaulin and Michael Sanford, Consultants, CampusNet Project; Maryon Urquhart, Director of Customer Relations, Ability Edge/Career Edge; Andy Cox, Employment Facilitator, The Work Bridge; and Stephen McDonnell, Recruiter, People with Disabilities, BMO - Bank of Montreal. The panel presentations provided valuable information to students in attendance on how to be an effective leader while in school, and how to translate the skills learned through student leadership into success in the world of work. The Halifax forum also featured displays from Ability Edge/Career Edge and BMO - Bank of Montreal. Jennifer Finlay asked Steve Estey to come up to the front of the room and say a few words. Steve Estey explained that he lives near Ottawa but went to school at Saint Mary's University, where he graduated in 1993. He became involved with NEADS before that time. Since 1998 he has been working on the student leadership and employment forums. He remarked that this is the 13th one in the last five years, and the second one in Nova Scotia (the first being at St. Francis Xavier University two years ago). There have been forums like this in every province except New Brunswick, Prince Edward Island and Saskatchewan. Estey said that it's difficult for many students to attend the NEADS national conference, which is held every second year in Ottawa. These forums represent the Board of Directors' effort to reach out locally on a regular basis. Beginning in 1998, NEADS has found that the skill sets involved in fostering leadership often parallel what employers are looking for in graduating employment candidates. Therefore, the Board has tried to marry the two concepts of leadership and employment, encouraging students to focus on these skills. The first workshop this morning is on leadership issues. Stephen Noel from Saint Mary's will talk about employment-related issues (what employers look for when recruiting) to set the stage for discussions in the afternoon. Kim Cooper explained that for 23 years, NSLEO has been advocating for recognition of the abilities of people with disabilities. NSLEO focuses on transportation, accessibility, provision of technical aids, home care versus technical supports, advocacy work in education, public awareness, and rights for persons with disabilities. NSLEO is comprised of seven affiliate groups, 50% of whom must be persons with disabilities. Globally, NSLEO is affiliated with the Council of Canadians with Disabilities (CCD) in Winnipeg. The issue of home care and home supports is extremely important. NSLEO has recently been involved with CCD & Ryerson University on the home support issue. Through an online survey, NSLEO is gathering the opinions of persons with disabilities regarding home supports. It facilitated a productive focus group for people on home support, focusing on suggestions for improvement, fears and barriers. Ryerson University will write up a report that will be available in the next few months through the NSLEO office. NSLEO made several recommendations that are outlined in position papers. The organization recommended that Nova Scotia have the option of a self-managed care program. This is one of the only provinces in Canada that does not have that option. This would allow fewer restrictions around hours. Currently, home care in Nova Scotia is restricted to certain hours. If a person is employed or going to school, and needs to be there at a certain time, it can be difficult to receive services. NSLEO recommended that all parties lobby federal MPs to support Bill C-206, a bill to change the Employment Insurance Act to allow individuals to care for a dying relative or someone who is under severe rehabilitation in the comfort of his or her own home. Caregiver leave should ensure a leave of absence from work, guaranteed job security, and EI benefits during the leave. Quality of life rather than financial aspects of the service should be emphasized. There should be access to technical aids in the home, at places of employment, in educational settings, and in the community. It's demeaning to approach organizations for technical aids, which are expensive. The government should set up a technical aids program similar to Saskatchewan Aids for Independent Living, where the government purchases technical aids and loans them out on a long-term basis. Policy should be in place around development of such a program to respond in timely fashion. Cooper added that it's extremely important for governments to involve stakeholders and persons with disabilities in this process. She said that she was very pleased that the Premier expressed an interest in looking at a wheelchair demo project for children, in partnership with the Abilities Foundation and other organizations. Cooper pointed out that transportation accessibility is a major concern. She said it's outrageous that persons with disabilities who need to go to a doctor's appointment, a community event, or employment must take Access-a-Bus (which has to be booked three weeks in advance in the Halifax Regional Municipality) or Y Taxi (which must be contacted 24 business hours ahead). NSLEO recommends that funding for the Accessible Assistance Program be increased by $10,000. The organization also asked that the license plate and registration fees be terminated for non-profit community-based transportation systems. In fact, on October 3rd, Service Nova Scotia and Municipal Relations decided to refund plate fees and Utility and Review Board fees for all non-profit community-based transportation systems providing accessible transportation! NSLEO also focuses on the non-enforcement of building codes (for example, new buildings are opening without ramps). While the organization would like to participate in the building code advisory committee, as in 1993, but it has been denied. Regarding education, NSLEO has established a Youth and Education Committee focused on inclusion of students with disabilities in the mainstream education system. As a result of advocacy work regarding mistreatment of a Digby child who had Down's syndrome, all teachers in Nova Scotia must now receive sensitivity training. The organization is going to recommend that the provincial government provide extra money for disability support, technical aids, accessibility, transportation, and teacher's aides (to increase their hours). In closing, Cooper said, "All persons with disabilities should get involved in policy discussions to promote changes in legislation. You people are the experts; you know what will work and what won't work." Angela Bowie spoke about the Student Accessibility Fund Committee at Dalhousie University. The fund began in the early 1990s when students lobbied to support students with disabilities who wanted to go along on trips, or needed signers or Braille at meetings. A levy of $1.75 per full-time student, and $1.00 per part-time student was established, totally an annual collection of $25,000. However, with the way the fund was designed, it's difficult to get money out. The fund currently sits at $75,000, and another $25,000 will be added this year. In the past, the fund was used to bring the third-floor bathrooms in the building housing the Dalhousie Students' Union up to code. Brochures and a Web site are being created to facilitate communication on campus regarding access issues and the purpose of the fund. Grant application forms for the Student Accessibility Fund are available at www.dsu.ca and via e-mail at dsudp@dal.ca. Joel Miller spoke about what it's like to have dyslexia, referring to the handout, "What Is a Learning Disability?" When he speaks to teachers, he asks them to read sections from page 2 aloud. (The letters are jumbled, making it difficult to read.) This shows teachers what it's like for students with dyslexia who are asked to read aloud. "I hope I don't get picked," is the thought that used to race through his mind. "I'd be trying so hard to read it, I'd make so many mistakes," he said. "I'd get embarrassed. It was really discouraging to read in front of people. I'd try to hide." Another exercise is to go through a maze, looking in the mirror so you can't see your hand. This shows what it's like for students who have poor motor skills. Miller added that although technologies such as laptops are available, "It's not always as easy as it seems." When he was going through high school, Miller told his teachers that he had a learning disability. They denied it and asked him to prove it. By contrast, the professors at Saint Mary's are very understanding when it comes to learning disabilities. Miller pointed out that many famous people have had learning disabilities, including Bill Cosby, Mozart, Isaac Newton, and Walt Disney. A participant said his high school experience resonated with Miller's; he pledged to bring the dyslexia awareness test to his former high school teachers. A participant asked, "Do you ever find that they say they're listening, but then they don't act on what you say? You say, 'I have to be separated to write my tests,' and then they set it up so you can't work in isolation." Miller replied that if he tells university officials what he needs, they'll usually let him go to the Atlantic Centre - the disability services centre on campus -- and get extra time to do the work on a computer. He uses Kurzweil 3000, a text-to-speech computer program. A participant said that in university some of her tests were formatted so she couldn't write them separately, particularly some of the lab courses. "The teachers forced me to do it with the rest of the class," she explained. "It was embarrassing. But I found an alternative format in the last few years." Asked, "Do you find you get judged by people in your student body?" Miller said, "I've been asked the most ridiculous questions, but I don't mind answering them. There should be more awareness. Most of my friends don't believe me." Miller said the students who had been at Saint Mary's before him paved the way for professors to understand learning disabilities. "Today, you won't find a professor who doesn't know about it," he said. On the other hand, the student body isn't as aware of the issue. "Say I had to read in class," Miller said. "I had a horrible time because of my dyslexia. Then, at lunch, people say, 'Oh, are you stupid or something?' That lack of knowledge is what I'm talking about." Stephen Noel said he feels that education should be considered an inalienable right, "but employment is a somewhat more dicey issue. You don't have a right for a job. You have the right to be treated fairly and equally." The Employment Connection at Saint Mary's has been downsized from five full-time people to just Stephen. He mostly meets new students at the Atlantic Centre. The Atlantic Centre has helped pave the way for students like Jennifer and Joel to have their needs met at university. Communication, most of which is by mass distribution e-mail, shows new students that there's someone there to assist them in their short- and long-term career goals. Noel writes cover letters and resumés, and he conducts mock interviews to teach interviewing skills. He talks to students about self-identifying as persons with disabilities in the interview process and in the workplace, and tries to stay abreast of opportunities for summer and part-time jobs, and internships. He meets with employers, particularly with federal contractors who are supposed to have a representative workforce. "They don't," he observed, "and they're not even close." Picking up work experience as a student is highly recommended, Noel said. Some of the programs available to students are not available after graduation. One example is a wage subsidy program sponsored by vocational rehabilitation programs offered through EAPD, which provides a 50% wage subsidy. The subsidy is like a marketing tool, but the student has to find his or her own job. Last year, all parties agreed that employers who couldn't come up with their half of the funding could also take advantage of another mainstream program offered through HRDC and combine the programs to cover all of the wages. Thirty years ago, having a degree was a virtual guarantee of a job. Today, it's much more competitive in the employment market, and often comes down to work experience. Just like anyone else, persons with disabilities have to do the networking, and they have to perform well in interviews and on the job. However, society at large still needs educating. "For example," Noel said, "I have dyslexia which means I have difficulty with the written word. I learn really well but I do struggle with this. So, you've identified an obstacle. After explaining to them, you say I need this kind of computer, and someone to read my reports. Some students are really good at that; some struggle with it." Sometimes, assertive strategies work best. If a job seeker is qualified but his or her disability is such that the candidate will not, in all likelihood, be granted a fair interview, Noel has collaborated with the job seeker, copying the application to HR and senior staff. "This seems to be quite effective," he reported, "because it creates the impression that it's not OK that this person has been prejudged because he's different. We're letting other people know. It's being opened up." Students are getting work experience by attending the NEADS session, Noel said, because they're learning organizational skills, and public speaking. His closing remark was to say that he knows of a brilliant student who went through university on a scholarship, but was unable to get a job when he graduated because he lacked work experience. Steve Estey pointed out that the banner on the NEADS Web site reads, "Celebrating 17 years of advocacy for full access to post-secondary education and employment opportunities, which is our right." There have been many improvements for people with disabilities in the post-secondary system during this time, and NEADS has had a lot to do with that, said Estey. There are connections between NSLEO, NEADS, and CCD. When Estey was President of NEADS from 1990 to 1992 he witnessed a lot of positive changes due to its work and collaboration with other non-governmental groups; NEADS became a member of CCD in the late '90s. Estey currently chairs CCD's International Committee, which has connections to organizations like the NSLEO. There are employment opportunities for people with disabilities with the federal government, said Estey. Governments must have people with disabilities as part of their workforce. As well, organizations like NEADS, NSLEO, CNIB, etc. need people who are bright and energetic and understand disability issues from the personal point of view. In addition, there are career possibilities in the NGO sector. "People with disabilities make up 10 to 15% of the population across the country," said Estey. "Yet how many wind up getting degrees? There's a whole range of opportunities out there within the disability service sector for skilled people like you." Estey added that LEO has a board of directors in Halifax, and the Canadian Association of Independent Living Centres is meeting in Halifax this weekend. Participants broke into small group discussion tables to answer questions. Question 1: What characteristics make a successful student leader? Question 2: Why do you think many students choose not to actively participate in advocacy on campus? Some may tend to focus inward, as opposed to outward. Some disabilities involve needing extra time. This limits time in other areas. There may be reluctance to disclose a disability; this leads to hesitation around advocacy. The extent of comfort students feel with an organization may affect their willingness to disclose. Lack of confidence to speak up and participate. At Mount Allison, there is an ebb and flow in group collaboration; those who don't see it that way may feel restricted. What can NEADS and leaders like you do to motivate them to get involved? Draw students without learning disabilities in, and let members with learning disabilities educate them. They will go out and be messengers in the general population regarding learning disabilities. We need to take the initiative in providing students in the general population with information. We should be proud of our successes and talk about the extent to which we are more knowledgeable now than 10 to 20 years ago. We need to encourage contact with facilitators of other clubs and societies on campus to increase awareness. At Mount Allison we set up booths and advertise what we have to offer. There needs to be an opportunity for orientation that includes sensitization of issues related to students with disabilities. Make more of an effort to meet students with disabilities. Question 3: How has being a student leader helped with the transition to work? In school, starting in high school, you can find these organizations, get help, and then you can give that help to others. Students with disabilities come together, promote change, and educate others. Question 4: How can student-run organizations do more for students with disabilities? As Angela Bowie said, the student levy of $1.75 at Dalhousie is a really good thing. Corporate sponsors could help out with the pop machines on campus. Ten cents per can of pop would be really useful to support accessibility initiatives. Get people together and address accessibility issues, so that it becomes a concern for the entire campus. CampusNet is an online collaborative community that brings together student leaders from across the country. The project staff includes Jennison Asuncion, Chris Gaulin, Michael Sanford, and Frank Smith. There is an advisory committee made up of student reps from across the country and two partners the Adaptech Research Network and the Quebec Association of Post-secondary Disabled Students (AQEIPS). CampusNet is funded by the Office of Learning Technologies, Human Resources Development Canada. The prime objective of CampusNet is to maintain NEADS' online community in which students can meet, discuss issues, and post reports. It also provides training to student leaders so that they can build their own Web presence and their own Web sites. It encourages student groups to form at a grass roots level, and helps to develop resources. CampusNet can also help with the transition from school to work. Chris Gaulin said that Steve Estey had summed up the situation well earlier this morning when he noted that the same skills used by student leaders are wanted by employers. The first of the CampusNet activities, in the second phase project, was to make a presentation at the 2002 conference. "Our work was just beginning," said Gaulin, noting that improvements are continually being made. CampusNet has developed a new directory of student groups and organizations; students can search by province, student unions, etc. Staff have developed training packages for student groups to create their own accessible Web site, and finally, the employment aspect of CampusNet has expanded. Broken into subject areas to help guide the conversation on access issues, the CampusNet Café provides a bulletin board for student discussion. NOWS - the NEADS Online Work System - provides a bilingual interface in which students can post resumés and search for employment opportunities. Employers can post employment opportunities, search for qualified candidates, and download resumés. NOW does have some limitations, however, said Gaulin. It's a channel for employers to find potential candidates, but should not be the only one - it's not WORKOPOLIS. Employers cannot search within resumés to find candidates; they have to download the resumé to find out more. Gaulin displayed an example of a page with job postings. CampusNet can be found at www.neads.ca/campusnet or www.nows.ca ; by e-mail campusnet@neads.ca; toll-free, 1-877-670-1256. Maryon Urquhart introduced Ability Edge, saying it's in six cities nationwide, including Halifax. Ability Edge specializes in internships for new graduates with disabilities (www.abilityedge.ca), whereas Career Edge deals with internships for the general population of graduates. All applicants must be approved on the basis of eligibility. The organization makes sure the applicant receives the accommodation needs required in the placement, based on information received when interviewing for a job. The e-mail address is: careers@abilityedge.ca. Ability Edge sends resumés to participating companies on behalf of applicants. "In this economy," Urquhart explained, "you may hear: Sorry, we can't add to our workforce now." The applicant works with a coach as a resource during the internship to ensure that it is successful. The organization utilizes different groups depending upon the disability of the intern -- for example, the Learning Disabilities of Nova Scotia. While the applicant must have a disability to eligible, Ability Edge does not need to know the nature of the disability. It just needs to know what accommodation is required. Most internships are full-time, although part-time is possible, if necessary. The purpose of the program is to increase the number of entry-level opportunities for graduates, and there is no age limit. Under the Youth Initiatives funding with HRDC, the host organization can receive support for the internships. The Ability Edge program has far less competition (with 500 Web site registrants) than Career Edge (with over 11,000 registrants). Because the organization is knowledgeable about diversity issues, it can help prepare the candidate for the first day of work. It can discuss potential problems in the workplace with interns, such as derogatory comments from people who do not understand the disability. Applicants register online, and employers can use the searchable resumé database to find the type of person they're looking for. When applying for an internship, Urquhart urged students to make sure the cover letter and resumé are tailored to the opportunity, and that there are no typos. Many employers will offer full-time employment before the term ends. Currently there are three Halifax interns working in Accounting, Human Resources, and Sales Effectiveness and Customer Loyalty. Ten host Ability Edge organizations have placed over 110 interns since 1999. Of those, 73% received employment within two to three months, and 60% have been hired full-time by the host organization. This compares to 50% at the Career Edge program. Stephen McDonnell said that BMO (Bank of Montreal) is Canada's oldest bank (185 years old), with $220 billion in assets, and over 30,000 employees. BMO is used to people with disabilities in the workforce. He suggested that candidates check out BMO's Web site to learn what its corporate values are. Like other major banks, the Employment Equity Act governs BMO. The CEO and Executive Vice-President meet quarterly to review representation of visible minorities and persons with disabilities, and ask, "Are we growing our populations?" McDonnell said that BMO is proactive regarding advancement of women (their target is to have a 50% representation of women at the executive level by 2007); aboriginal people, employment of people with disabilities; and advancement of visible minorities. In 1992, 9% of executives were women, compared with 36.2% today; .5% were aboriginal, compared with 1.3% today. He spoke of misperceptions regarding the cost of accommodating persons with disabilities, and then added that 80% of accommodations can be achieved at reasonable or no cost. Furthermore, he said that persons with disabilities do not take more than their share of sick leave. One BMO employee uses Kurzweil 3000 to accommodate his learning disability, and has a job coach to organize information. He is one of BMO's most successful investment advisers, having brought $54 million into the organization in the last 10 years. "We understand accommodation," McDonnell said, citing the example of an employee with narcolepsy (a seizure disorder that causes the person to fall asleep). The bank built a sleep room in the office tower where that individual sleeps for 20 minutes every two hours, and has been seizure- free since. In 2000, nine of the ten interns were offered permanent employment. In 2001, of eight employees, six were placed in positions. In 2002 there were 12 interns, and in 2003, 14. BMO has a 78% success rate moving interns into full-time employment. During a job search, the employer needs to see the applicant as a person first, as a person with ability second, and finally, as a person with a disability. McDonnell stressed the importance of completing one's education, getting work experience, keeping in touch with professors, and building one's job network. He praised the Internet as "the greatest tool" which enables the job seeker to learn about the prospective company's value statements, and learn whether they have a public accountability statement (a commitment to work with people with disabilities). Find out what policies the company has regarding accommodation. Determine if the company offers a tour of the facility. Find out if literature is available in alternate format. If the applicant decides not to disclose, no good employer will ask him or her to. Instead, the employer will ask what accommodation is needed to get the job done, and the applicant must make it clear what is needed. Regarding confidentiality, McDonnell said, "We've brought people home from both wars. We're the confidentiality experts. We haven't told anyone else's bank balance." His parting words were, "Don't be modest about what you need because you think it's going to cost too much. Companies want to hire on abilities. Values is the important piece of the 21st century." Andy Cox introduced The Work Bridge, which is an NGO in the Halifax Regional Municipality, funded by HRDC. Its purpose is to help persons with disabilities help themselves find gainful employment, but it is not a placement agency. Through a Teamwork Co-operative, The Work Bridge is in touch with other agencies that deal with persons with disabilities. Examples include the Independent Resource Centre (a national organization), CNIB, the Canadian Paraplegic Association, and the Canadian Mental Health Association. The Work Bridge only requires an intake form (no doctor's certificate). Disabilities served by the program include cognitive, developmental/intellectual, health, hearing, mental health, physical, and visual. The organization primarily deals with individuals who have a post-secondary education, and in some cases, a high school education. Of five or six employment counsellors, one specializes in youth. Do you have a clear job goal? Are you qualified to work at the job you want? Do you seriously want to work? The organization provides leads and contacts, opens doors to contacts, provides job-search skills including networking, and helps with disclosure issues. It can also help to locate funding sources, such as the HRDC Opportunities Fund, and EAPD (Department of Community Services). Helping to navigate the system, both federally and provincially, is an important role for The Work Bridge as it helps to find funding for accommodation. Accommodation does not always require a large investment (like an elevator), said Cox. Sometimes shifting around the workplace, or providing tools in Braille can get the job done. The Work Bridge is familiar with Halifax-area schools, and can refer career development issues to other organizations in the cooperative in a bid to help people become more independent. The organization's advocacy work involves educating employers. When an applicant lands a job, he or she remains on the active list and The Work Bridge intervenes if there is an incident of discrimination. "We assist in helping people leave behind impoverishment and become self-sustaining," said Cox. Through a computerized skill assessment, The Work Bridge can take a client through the process of assessing whether he or she is work-ready for that position. Workshops are hosted on resumé writing, partnering with other agencies, self-esteem, disclosure, and self-care on the job. Cox told a story about a client in his 50s who had had 56 different jobs. "He has no problem getting jobs, but can't maintain them," he explained. "So we fought for money to create a position for him to do job development. Now he goes out to organizations and companies and looks for jobs for us. He's quite successful." The Work Bridge provides services to youth aged 16 to 30. There are 11 employees, the majority of whom have disabilities including Tourette's syndrome, autism, Asperger's syndrome, Crohn's disease, hearing impairments, ADHD, clinical depression, and brain injury. Telling participants that he has bipolar disorder, Cox said, "We can relate to a lot of our clients. Sometimes…we will disclose with our clients, and a bond happens." Thanks to a partnership with Job Junction (located across the hall from the Work Bridge) anyone can use its resources to look for work. There is also an assistive technology station, voice activation, motorized workstation, and CCTV. In the summer, The Work Bridge partners with the Department of Education and the Nova Scotia Community College to offer job-finding clubs. The organization has served over 700 individuals in the past three years in Nova Scotia. Question 1: Why do you think there's a high unemployment rate among graduates with disabilities? What solutions do you have to address this issue? Employers see people with disabilities as not ideal citizens; they don't fit into the social norm. They don't see our ability. They are focusing on our disability. There's a misconception that people with disabilities don't have the same strengths as people with no disabilities. There are stereotypes. For example, people might think that dyslexics can't do the job as well. You can't help it if there aren't jobs in your region. The only thing you can do is move where the jobs are. The student can lack job experience, might be shy about his or her disability, or is concentrating on schoolwork. The solution is to encourage people with disabilities to volunteer in clubs and organizations that will give them experience, get part-time or summer jobs instead of focusing solely on their studies, and educate local corporations so they understand that it's not as expensive as they aim to adjust to people with disabilities. Question 2: What method(s) do you use to learn about employment opportunities? Most of us in small communities rely mostly on the Internet, including Web sites such as www.monster.ca , and actual companies' Web sites. This is particularly true for summer jobs. Knocking on doors - even on the Internet through e-mail - to see if companies are hiring for the summer. Bulletin boards, newspapers, classified ads, word of mouth, and the Internet. Create your own business, and think outside the box. Question 3: What can employers do to ensure that qualified students and graduates with disabilities learn about available job and internship opportunities? Put a note on their ads saying that they are disability-friendly. (On Monster, every job will indicate if it is disability-friendly.) This will encourage applicants with disabilities. Have a recruiter come to the universities and say that their company is good at being inclusive and that people with disabilities are welcome. Employers could give this information to employment counsellors. Employers could volunteer with NEADS (such as coming to an event like this) and speak about their company and what accommodations they make. Question 4: Would you disclose your disability before and/or during a job interview? If so, why? If not, why not? No, we would probably not disclose beforehand. In this day and age, we feel that employers are not quite educated enough. In a job interview you should say this is my problem. A lot of employers don't know a lot about disabilities, or what their responsibilities are, especially with invisible disabilities. You don't want to sit there and lecture for 20 minutes about what a mental health disability is. It's not the appropriate place. We need education early on - perhaps even in university/college - so that when students become employers they will be sensitive to disability issues. Until society comes to a point where that understanding is there, we're sort of "iffy" about whether it should be disclosed. Question 5: What skills do you think are the most sought after by industry? A commitment to continuous learning is the most important. With technology always changing, you have to keep updating your skills. The ability to create and work in the atmosphere of your respective job, whether it's public speaking or teaching math. That includes a lot of communication. A work ethic. If you have a good work ethic and it shows, you're more likely to create your opportunities. Versatility: the ability to work in all situations. A participant said that whether or not one discloses, it's important to demonstrate confidence, and not to be afraid of making mistakes once the job begins. She added that it's important to know how to respond if a mistake is made. It's all about confronting the situation and dealing with it. Stephen McDonnell emphasized that disclosing one's accommodation needs is critical to success. A participant asked how a pre-existing condition would apply to an employer, particularly if the applicant did not want to disclose. McDonnell replied that it's not legal to ask this question in an interview. Another participant said it had happened to them. Participants voiced their appreciation for the day, especially for the connection made between leadership and employment. The word "leadership" does not necessarily refer to the top-down, "presidential" form of leadership. It's also about getting involved through collaboration and teamwork. Steve Estey thanked Jennifer Finlay, NEADS' Nova Scotia Rep., as well as others who helped organize the session. He thanked the speakers for taking the time to make presentations during the day. Next year if NEADS comes to the East Coast, he suggested the session may be held in Sackville -- considering the large group that attended from Mount Allison University -- and the Halifax people could travel there. He pointed out that a huge amount of information was imparted, especially about specific programs. The Association publishes detailed reports on each forum that are posted on the NEADS Web site. Along with the reports of the previous 12 forums, there is other information online about programs run by HRDC, affiliated non-governmental organizations etc. Referring to a question as to whether there are similar programs in other cities across Canada, Estey said there are other programs similar to The Work Bridge in all major cities. He suggested that those who are not from Halifax check out the Web site, and make contact with their local HRDC representatives. Finally, he noted that the report from this session would be posted on the NEADS Web site in the next couple of weeks.